Owen made his middle school soccer (football) debut yesterday. 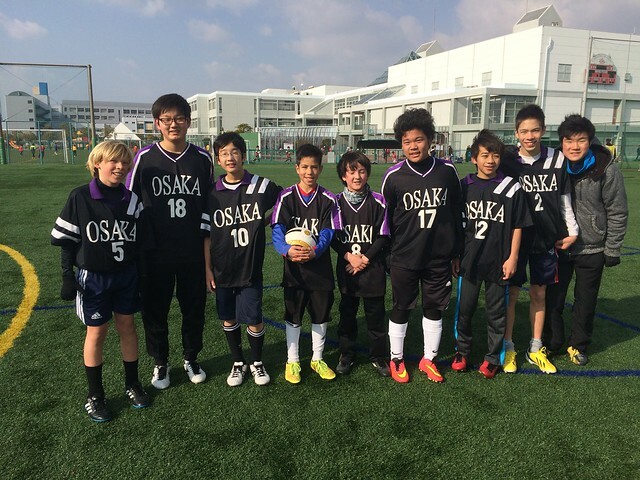 The Senri & Osaka International Schools Sabers travelled to Kobe to play the Canadian Academy Falcons (CA). CA is located on Rokko Island, an artificial island in the Bay of Osaka, which is home to a large shipping port. Yesterday, January 17th was a special day in Kobe, as it was the 20th anniversary of the Great Hanshin earthquake in which over 6,000 died. The game started with a moment of silence for the victims of the tragedy. In the SOIS middle school, there is about 150 boys, so the team has a lot of players. Six grader Owen plays on the “B” team which is reserved for the younger players. They won their game 5-4 and Owen scored two goals and assisted on another. The team was up 3-0 at halftime, but their positioning broke down in the second half, combined with more aggressive play from CA, made the game close. Owen is not passionate about soccer, but is enjoying the sport. I like it because it makes them run around and is outdoors. Owen played midfield and is learning a lot about the sport. I hope he continues to play. 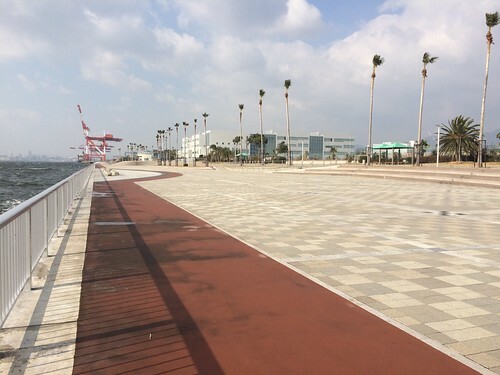 The Rokko Island pier and running track. In between games, I went for a run around Rokko Island. There is a nice 5 kilometer loop set in a park like setting which hides the warehouses and stacks of shipping containers that make up most of the island. The earthquake really hurt the port economically. Before the quake, they were much busier, but with the destroyed facilities, Singapore and Hong Kong took over much of the business and Kobe never recovered. Today the island is much quieter with a less busy port and businesses also moved out of Kobe as well. It is nice being on the water however, but the environment is a bit sterile on the island and it feels like one is not in Japan. 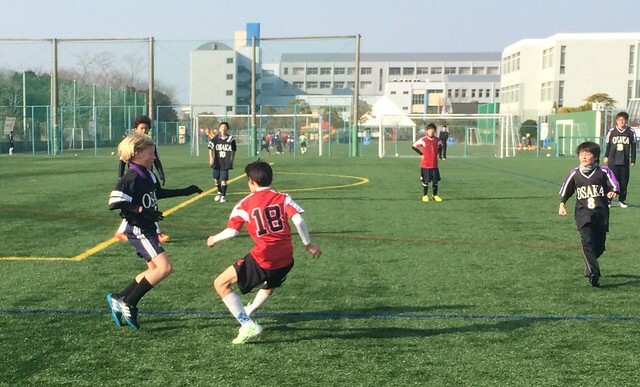 The MS boys’ soccer Sabers are in action next week as they host Kyoto International Academy. The grade 8 students are on a science field trip so the younger students will get a chance to play against older students.